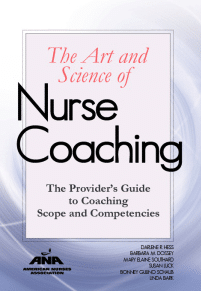 The Art and Science of Nurse Coaching: The Provider’s Guide to Coaching Scope and Competencies describes the rapidly emerging role of Nurse Coach – a role that speaks to the heart of nursing, but one that all providers can embrace. Nurse Coaches establish co-creative partnerships with clients to facilitate a process of change that assists them in realizing undeveloped potential. Self-care, intentionality, presence, mindfulness, and therapeutic use of self are vital components of effective Nurse Coaching. Create a safe space for coaching conversations. Provide a structure for further coaching sessions. Explore client readiness for change. Assist clients to identify goals, select action steps, evaluate progress, and sustain life changes. Learn the importance of coaching clients becoming aware of their challenges and celebrating their accomplishments. Learn new, valuable ways to assist clients to adopt effective, sustainable life-changing behaviors.